Old Dominion Animal Hospital performs many varieties of veterinary surgery, and our veterinarians work in a fully equipped surgical facility. We offer a wide variety of soft-tissue surgeries and limited orthopedic procedures. We are committed to providing safe anesthesia and effective pain management for all of our patients. 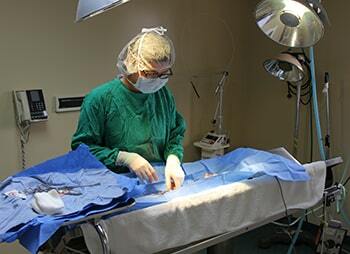 Our veterinarians are excellent surgeons, and they provide outstanding care and attention to your pet’s needs. Their experience in veterinary surgery has shown remarkable ability and hours of past surgery have also made them experts. Our veterinary technicians are dedicated to keeping your pet comfortable and healthy throughout all procedures. They also communicate with owners to let them know that pets are recovering well, and to help explain and carry out effective recovery.